Eye catcher at the art fair in the Louvre Paris. 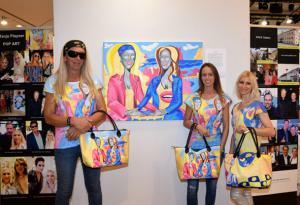 Pop Art artist Tanja Playner caused for a stir with her art performance at the Louvre Museum. PARIS, FRANCE, November 8, 2018 /EINPresswire.com/ — Paris / The PAKS Gallery caused for a stir with its exhibition at the Louvre Paris. Heinz Playner, curator and director of the PAKS Gallery, presented international artists from all over the world in the Louvre complex where the pyramid connects the Louvre Museum and Carrousel du Louvre in the Salle Delorme. Thousands of visitors have come to the art fair at the Carrousel du Louvre to see and purchase international contemporary art from around 800 artists. At the opening on 19 October was also the German celebrity couple Alicia and Nicki King. 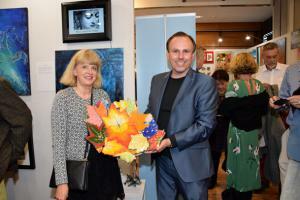 The well-known VOX-TV celebrities came to the inauguration of the work of art created by Pop Art artist Tanja Playner. In the same pose as the Mona Lisa, except for the crossed hand gesture as a sign of cohesion and the strength of love and the Coin of Love signs of Tanja Playner were not only on the artwork to see, but also to the project to produce bags and T- shirts. Artistically presented on October 20 Alicia and Nicki Kings presented with the Pop art artist Tanja Playner the project art project "Mona Lady Eccentric" right next to the Mona Lisa by Leonardo Da Vinci in the Musee du Louvre. 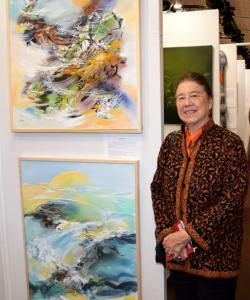 Curated by curator Heinz Playner, the PAKS Gallery also displayed artworks by artist Wendy Yeo among the selected artists of the show at Carrousel du Louvre Paris this year. "Artwork by Wendy Yeo show an elegant composition of calm. At the same time you can see the movement of the water and the fish. It draws the eyes of the beholder to see the artwork again and again. The choice of colors has a constructive and calming effect and shows a perfect symbiosis between Asian and European cultures "- says Heinz Playner about art by Wendy Yeo. Also striking were the artworks of the artist Charlotta Hoglund. She deals with city maps and her perception of the world through her collages. The artist is also important to show the tenderness of the inner world, which is often represented by a combination of delicate flowers and people. "The entire combination of works of art is fascinating" – says curator Heinz Playner. Also graphic work could be seen in Complex du Louvre. The PAKS Gallery showed the work of the Swiss artist Nina – Nadine Pillet. The precise, nostalgic elaboration of the shades inspire with their effect. It shows that even today coal is a fascinating expression of art. What's special about Nina's works is that she does not simply paint with charcoal powder, but brushes the brush with the brush stroke by line until the strokes create a perfect expression. With the artworks of Luisa Barba gallery owner Heinz Playner showed at the art fair in Paris surrealist emotional works of art. Architectural elements of the artist expressed through crying eyes are not only an eye-catcher, but also a philosophical symbolism. And this symbolism combined with elements from history and antiquity are an interesting element in the art of Luisa Barba. In the sculpture sector, the sculpture was presented by Gunilla Klemendz. The elegance and the colorful play are a sign of her compositions. The artist deals with leaves. The sculptures are often reminiscent of falling leaves. Gunilla Klemendz not only creates an aesthetic look of the work, but also a look to the memory of individual moments of life and the questioning: what has been one and what will one be in the future.